exhaustively detailed by the Moroccan press—swirled around the racy film. With surprising complexity, "Amours Voilées" treated the struggles of Batoul, a contemporary Casablancan woman, to juggle professional ambitions, love interests, and her family's traditions. Whereas such themes, if covered by American cinema, would have been inevitably oversimplified, to my pleasant surprise the film's producers embraced the nuances and ambiguities which define the coming-of-age process for young Moroccans today. As fascinating a glimpse as Amours Voilées offered into the struggles of contemporary Moroccan women, I still wonder how the film might have been different had it not been written, directed, and produced by a man. Such are the ironies of life here in Morocco. 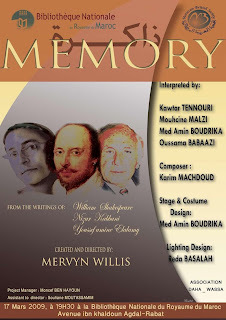 Later in the month, Jacqueline and I decided to attend a play, "Memory" ("ذاكرة"), at the National Library theater. 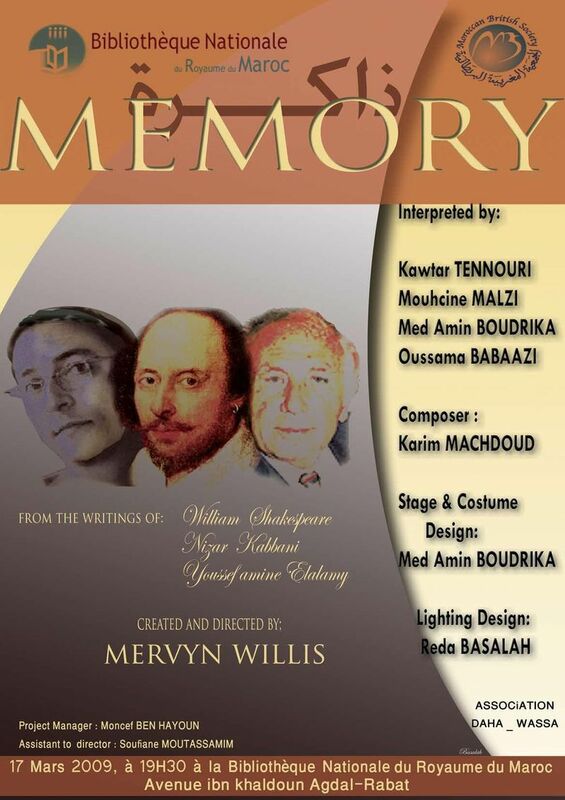 The production was somewhat experimental—a trilingual mélange of excerpts from the writings of William Shakespeare, the eminent Syrian poet Nizar Qabbani, and Moroccan popular novelist Youssouf Amine Elalamy. In the absence of a readily discernible plot, the play's abrupt jumps made it seem more like a disjointed series of sketches than a true story, but the actors executed their ever-shifting roles with gusto. Next, we're looking forward to the Mawazine Festival, scheduled to take place in several venues around Rabat in mid-May. It has attracted an eclectic, international lineup—Stevie Wonder, Khaled, Samira Said, the Neville Brothers, Sergio Mendes, Sherine, Alicia Keys, Wael Kfouri, Johnny Clegg, Amadou and Mariam, and more.